I’ve worked with RGB LED Waterproof Flexi-Strips in a few other projects (RGB Lamps, Under-counter RGB Light, and Curio Cabinet RGB Light), and got the idea of attaching them to fabric to create a suit. For more light, I went with the 60 LED-per-meter version. Previously, I used an Arduino to control the lights, but then saw the Touch Wheel Controller for Analog RGB LED Strips from AdaFruit and decided to incorporate that as the interactive control pad. AdaFruit also offered the Solderless Analog RGB LED Strip Clip Sampler, so I bought a set to try out. The solderless strip clips really drive the amount of rubber material to remove. The solderless clips really need to be soldered. I’m sure they’re fine to slide on for a static application, but for a wearable costume, there is too much movement and the contacts slide. I was able to get a protytpe built using just one strip clip sampler set. The set comes with 2 double-ended and 1 single-ended clip. I used the pre-soldered wire on the end of the flexi-strip reel as one of the connections for the main body. I used the single ended clip for the other end of the main body. I used the double-ended clips to connect the arms and legs, and then spliced the wire from the main body into those double-ended clip sets. I realized that for ease of use, I really needed a detachable connector in between the top and the bottom to attach the to 2 articles of clothing. I needed a robust 4-wire connector that would not separate easily. I rummaged through my drawer of old computer parts and found a bunch of 4-pin connectors from PC power supplies. I spliced matching pairs of those into the wiring. The control wire hard wired into the bottom (pant) part of the light strip because the controller and battery will be kept there. I was sure to use the female part of the connector for the bottom (pant) part just in case the connector did disengage – I didn’t want an accidental shock if the male-end was exposed and live. The touch-wheel controller is very easy to use – on/off, touch a color to activate the color, and a mode button to cycle through various colors and even some automatic sequencing. Very cool. I needed a way to make it wearable, so bought a Makita Belt Clip on eBay (indented for use with a Makita power tool, but worked fine for my needs. I bought a nice 8 AA battery holder that uses a 9V battery clip for easy connect/disconnect of the power. Connecting the LED flexi-strips to the suit was a bit more difficult than I expected. They come with a peel-off strip that exposes some adhesive, but it doesn’t stick very well to cotton fabric. I considered some secondary adhesive, but opted to re-enforce the ends with a few loops of thread. I found the LED Flexi-strips don’t get hot, and are very flexible, so they are perfect for this application. In anticipation of the fall chill, we opted for long black-denim pants and a black denim hoodie with a pocket in the front. The black fabric will help to hide the shape of the body when the lights are out so it just appears as a floating “stick-man”. Putting the hood up enhances the effect. Hmm. Wait, a headless stick-man? That won’t do! I needed some way to light up the head. Over to Amazon for some rave apparel. I bought some light-up LED Shutter Shades in 4 different colors and some Fiber optic Lazer fingers LED Flashers (8 per person) in 4 different colors. Now, when the lights go out, we’ve got a floating stick-man with glowing sunglasses and fingers. Unfortunately, the sunglasses and fingers were static colors which did not match the color-changing capabilities of the rest of the suit. I briefly considered hacking these to make them RGB-able, but they were such cheap quality, they would never have survived. So, we’ll just make due. We tested it outside in daylight and the LEDs were still very visible. This outside test lasted about 30 seconds since it was about 100 degrees F outside and my daughter started sweating immediately in the hot suit. In the prototype, I used the Makita belt clip which has a perpendicular metal piece that inserts into a slot of the tool for support. For the prototype, I attempted to hammer this flat so I could mount it on the outside of the Wheel Controller. I don’t have the right tools for this, so it didn’t turn out great. It occured to me that I could just use my Dremel to cut a slot into the plastic of the Wheel Controller case and use that for additional support. I did this for the other 3 and it worked well. There was plenty of clearance inside the case for the belt clip part and screws. For best results, use a knife to scrape away the fine layer on top of each electrical pad on the LED Flexi-strip before you attached the clips. 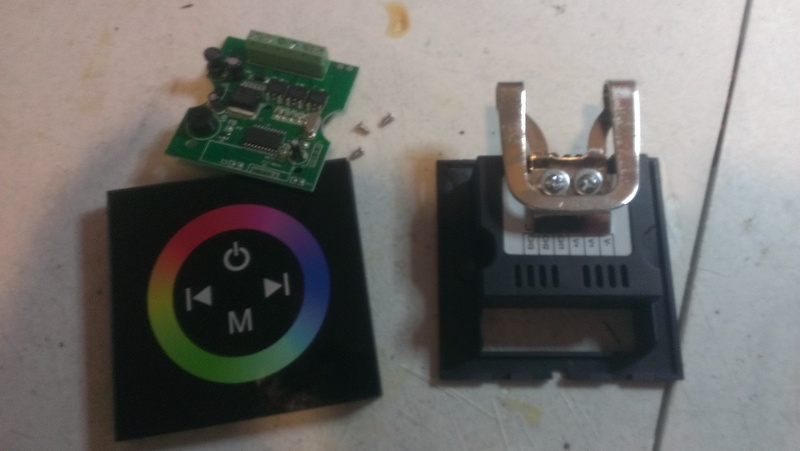 This largely solved the most time consuming effort of the electronic build which was getting all 3 color channels to work. The kids have shorter limbs, so used smaller segments of strip which consume less energy. An 8xAA battery set was good for them. However, my wife and I needed more juice to keep the suit lit. I opted for an 8xC battery clip for the adult suits. I also bought a black fanny pack (oh, the sacrifices I make for Halloween) to house the bigger battery pack, and to possibly keep spare batteries. At least, when the lights go out, no one will see my fashion faux pas. It was June and I had completed all 4 costumes. Yeah! Time to hang them in the closet and wait for October. Then, one day, while surfing the web, I came across this video from Phil Burgess and his Electronic Demon Costume. Wow, that looks amazing! I must have/build one for myself! Maybe I could incorporate that into my costume for this year? Just when I thought I was done, Phil drags me back in to make a mask. Thanks Phil! So, I buy 4 masks, and I’m all set to start prototyping a new build, when it occurs to me that my son depends on his glasses to see and he would be unable to wear the mask. Also, masks are hot and uncomfortable and other members of my family objected. Ok, so maybe I don’t to the full mask. Maybe I just work on the eyes. Phil mentioned challenges with hiding the large Arduino Uno and battery pack on the body with wires connected to the mask. I wanted to avoid having wires between the body and head, so I researched a way to mount the microcontroller on the head. 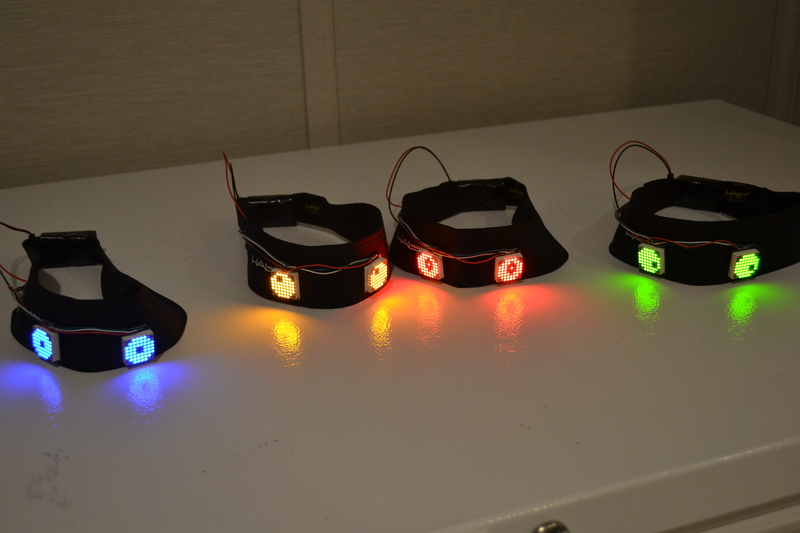 So, I bought a black Halo II headband from Amazon, and a pair of small 8×8 LED matrix modules with backpacks from AdaFruit. I had an extra Arduino Pro Mini 328 (5V/16MHz version) from SparkFun already, so used it as the driver for the LEDs once I confirmed it had an I2C interface. 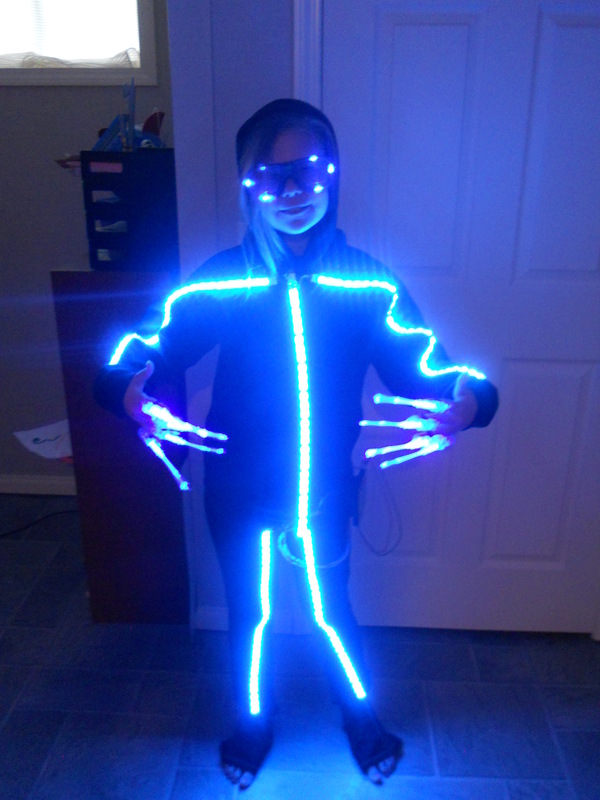 I wired everything up on a breadboard and uploaded Phil’s demon costume code – it worked! Wow, that was easier than I expected. 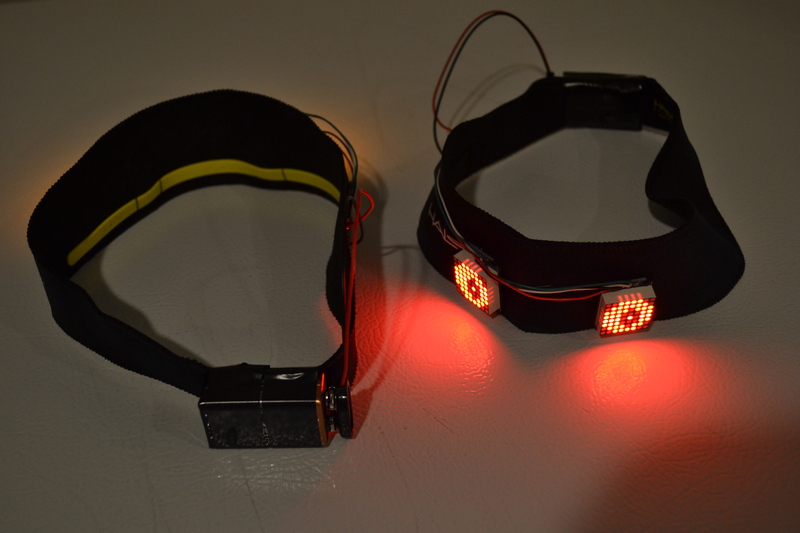 Next I sewed (yes, I sewed) the LED matrix modules and Arduino Mini Pro onto the headband, and taped a 9V battery onto the back. I put it on, and it looked great! The headbands are VERY comfortable and have a nice rubber lining that keep it from slipping. I’ve worn it for 4 hours straight without issue. The battery in the back gives it a nice balanced weight. One thing I found with the Arduino Pro Minis – when I plug in a fresh 9V battery, they get REALLY hot and the eyes don’t move. I used my IR thermometer and clocked it at about 110 degrees F. However, after letting the juice bleed off a bit (takes about 10 min), then the board cools down and the eyes start moving. I suspect that I’m just barely maxing out the power regulator on the chip and when the voltage drops below a threshold, it works fine. Hopefully, I won’t damage the board when I put new batteries in later. Once the prototype was determined to be a success, I built 3 more – each with a different color. My daughter requested that I figure out a way to make “snake eyes” instead of the eyes in Phil’s code. So I dove in and did some code tweaking to give her set a different look. I had to do quite a bit of code tuning because there was a notable lag with the drawing of the bigger iris. Oct. 20 update – we did a dress rehearsal and everything worked well. We identified areas that needed a bit more E6000 glue, and tried to debug some weird shorts in my wife’s suit that made half of a strand shift colors. 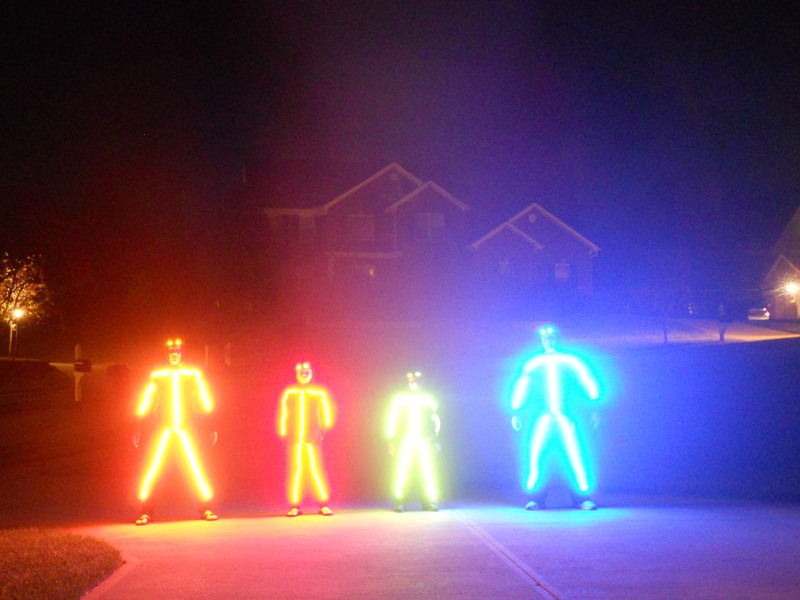 The suits were comfortable outside in 45 degree F weather, but gloves may be needed for Halloween. While testing, it occurred to me that we were highly visible when facing each other, but when our backs were turned, we were nearly invisible. This is a problem for Trick or Treating since I want to be sure the kids are visible to cars that drive by in the dark. To mitigate this risk, I added stripes of 3M Scotchcal reflective tape to the back of each costume. This stuff is amazing – it is normally black, but reflects bright white. Tonight was the debut of the costumes at the kid’s Trunk-or-Treat party. Overall, there were mixed results and a lot of new lessons learned. My son won the “Most Original Costume” award and had a great time. The interactive touchpad controlling the color of the LED lights was a huge hit with other kids at the party. They all came up wanting to take turns selecting the color. The initial candy handout was outside in the parking lot. The temp dropped below 45 degrees F and the LED strips became rigid. The strips on the legs of my wife’s costume cracked, then broke completely (kind of reminded me of the T-1000 Terminator emerging from the bath of liquid Nitrogen). Once we went inside and warmed up, the strips became flexible again, but there were lots of cracks. My costume seemed fine, even outside. I think one of the reels of LED strips was faulty and resulted in the issue. The data sheet is not in English, so I’m not sure what the designed temperature tolerances are. There are warnings about direct sunlight and submersion in water, but nothing about temperature. Lesson learned – only use in warm weather. My son managed to pull out one of the wires during play. I did not come prepared with a screw driver to reconnect the wire. Luckily I was able to borrow a screwdriver and reattach the wire. Lesson learned – come prepared with the tools for quick repairs. The adhesive attaching the LED strips to the upper legs did not hold for my son, wife and daughter. Mine was fine, not sure why. 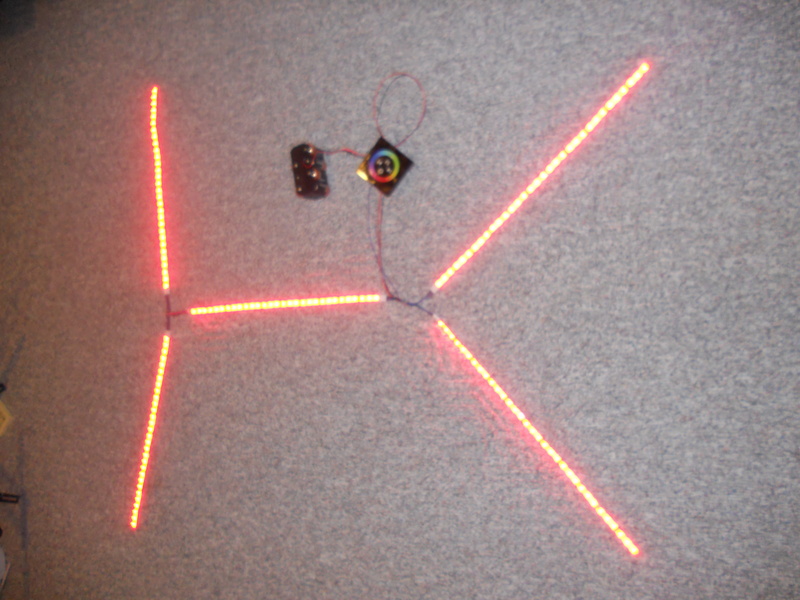 The thread loops held the tops of the LED strips to the upper thighs so that they did not come off completely. Lesson learned – add more thread loops. Ugh! The rain prevented us from wearing our costumes. All that work and planning and we didn’t even get to wear them on Halloween night! Despite my warnings, the kids still wanted to go out, so we instituted “Plan B” and wore traditional, un-powered costumes. They came home soaked to the bone and freezing cold, but also piles of candy. Looking forward to next year! This is an assume and unique costume. I saw adafruit posted this in G+ and I needed to know more. I am not an engineer, but would like to try making this. Would you mind if I post any questions I have on your blog? Thanks so much. Yes, of course – please post any questions. I would like to get some information with regards to a project I’m working on. I would like to have LED strips built on to our cheerleader uniforms for a performance. I’ve attached a video to give you a better understanding of what I am trying to accomplish. Please let me know if I can be of any further assistance. Good luck! how can these run on say a 9v battery get atleast 1-2 hour run time with 2 strips. 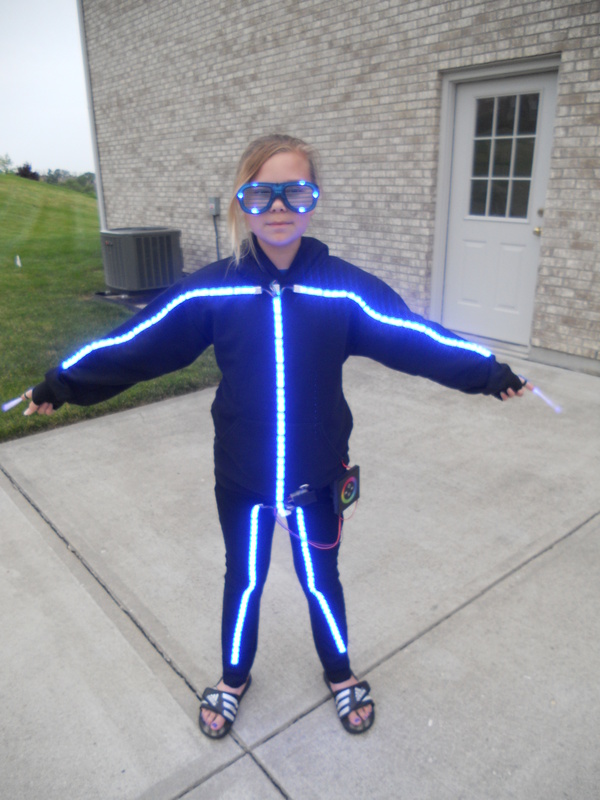 Sorry to report that the LED strips that I use require 12V I am using 8 AA batteries for a kid-size suit and 8 C batteries for an adult-size suit and was able to get a full 4+ hours of light. 9V will not be enough to power these LED strips. You might be able to get away with 8 AAA batteries if you only need 1-2 hours of run time. Also, if you look around, you may be able to find an LED strip that runs on less voltage, but I’ve not seen any. Good luck! So funny to read this. You went through so many of the issues that I did last year when building them for snowboarding. The LED strips cracking in cold was so frustrating! I’m the guy that did the baby LED costume that went crazy viral btw. It’s cool finding someone that likes to mess around with all kinds of electronic stuff like I do. Thanks so much for your comment. Congratz on your great costume – I saw you being interviewed on TV and echo your sentiments around not really looking to make money off of this, I’d rather just share the idea and hope to inspire others. CNN and a few other syndicates picked up my costumes for their web blogs, but I didn’t get nearly the visibility you got. Thanks for representing us ‘makers’ so well! Other than using 8 AA batteries,are there any other power sources I could use? Its for a performance and I’d like the power supply to be ‘light’…if you get what I mean. There are certainly options for batteries smaller than AA batteries that may meet your needs. 8 AAA batteries will most certainly work fine. There are also AAAA and N batteries that are even smaller, although a bit more difficult to find. Theoretically, a set of 8 x 1.5V coin cell batteries (like the ones used by watches and hearing aids) could also work – I’ve not tried it, myself (note that not all coin cell batteries are 1.5V). An A23 battery is really just a stack of 8 coin cell batteries in a single package to provide 12V – you might consider experimenting with it also. However, as the battery gets smaller, the amount of time the LED lights will run will also decrease. Also, the number and types of LED lights you have on at the same time will also impact the life of the batteries. If you just need them to light up for a 5 minute dance and will cycle them on/off in patterns as shown in your example video, then you may be OK with a set of coin cell batteries. If you are considering using it for a show including multiple dances, they may not last. A final thought – There are a variety of sewable coin cell battery holders available so you may be able to sew them directly onto the costume. Thank you very much for the advice. I’m ready to purchase the items and get them ready for the performance on march 4th. I want to be sure I get the right things. I would love for you to guide me right up to the performance. Could you contact me at damion.bartley@gmail.com. 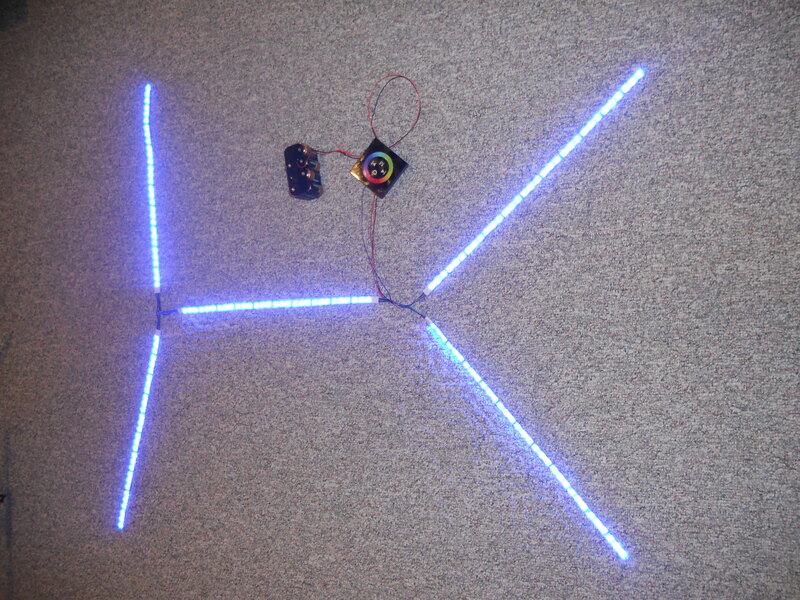 Also I’m thinking about using an Arduino to program the lights and have them run themselves for the performance. Reply ASAP! Hey I was just wondering whether you got much more battery life by turning the brightness down? The Touch Wheel Controller I used to drive the LED strips did not provide an option to dim the lights. However, in theory, using a different controller that can adjust the LED duty cycle, the battery life should increase significantly. Looking at the Touch Wheel Controller there that you linked, it says it has 100 brightness levels in the Technical Details. I can’t seem to find any information on how to adjust it though. 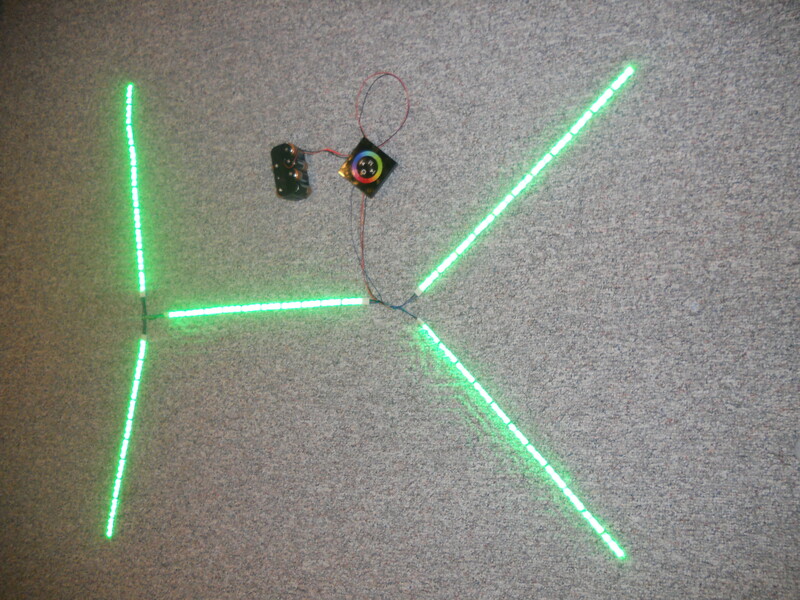 Also I was thinking of making this suit with the 30 LEDs per meter instead of the 60. Again just looking to save battery life. What was your experience with the 60s? Do you think the 30s would look alright? I used C Batteries to power my large suits. An Alkaline C Battery provides 8,000 mAh. When I connect 8 of them in series, the voltage becomes 12V, and the capacity remains at about 8,000 mAh. So, by dividing 8,000 mAh / 11160mA = 0.717 hours. That means I can run all lights at max brightness for 45 minutes, theoretically. In practice, this duration will be less since the voltage will drop below the required threshold before I fully drain the capacity of the battery. More realistically, I typically set up the controller to cycle through colours and don’t have all the LEDs in a pixel on at once. Some colour outputs require a blend of full and partial duty cycles for one or more LEDs in a pixel which reduce the current draw and therefore allow for longer battery life. At the Halloween party, I had the suit running for 2+ hours and still had extra capacity. Reducing from 60 to 30 LEDs per meter means that the number of pixels is cut in half which means that the current draw is also decreased in half. The 45 minute “worst case” scenario increases to 90 minutes in this case. If you set it to colour cycle, the 2+ hours would increase to 4+ hours. Of course, this change will also result in less brightness and more notable “gaps” between pixels. I’m happy with my choice of the 60/meter because of the way it looks, but if battery life is more important for you, then making the changes discussed above will help. Hope this is useful. Others can save themselves the trouble and purchase them. I found this site selling them.